This is a mix of Srixon practice grade golf balls. The balls may have scuffs, scratches and player markings such as logo's or texta marks. The balls are a random mix of models such as Soft Feel, AD333, TriSpeed, Soft Feel Lady, Distance and other Srixon models. These balls are perfect for having a hit at the park or on the local sports oval and provide you a great way to practice with Srixon golf balls and not break the bank. Mixed Srixon Practice Grade Golf Balls This is a mix of Srixon practice grade golf balls. The balls may have scuffs, scratches and player markings such as logo's or texta marks. 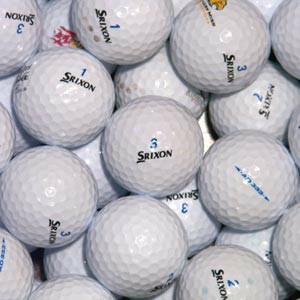 The balls are a random mix of models such as Soft Feel, AD333, TriSpeed, Soft Feel Lady, Distance and other Srixon models. These balls are perfect for having a hit at the park or on the local sports oval and provide you a great way to practice with Srixon golf balls and not break the bank. We are currently offering a flate rate of $8.50 postage on all orders regardless of how many golf balls you purchase!